An educational tour of Peru narrated by anthropologist Manuel Arboleda G.
​and co-hosted by Vinh Phung. ​and a leisure day in the charming city of imperial Cusco! As your study leader (I am an anthropologist by profession), I will be providing you with an annotated reading list before you go as well as an educational kit consisting of maps, charts and articles written specifically to enhance your educational experience. So what are you waiting for? Sign up as space is limited! Depart your home country and arrive to Lima late at night. Due to our past experience with people arriving at different times and in different carriers – and therefore lengthy delays at the airports waiting for others to arrive, we are now encouraging tour members to take Green Taxi, a safe and reliable taxi company, to their hotel. Note: Rooms will be ready for check in starting at 13:00 hrs. Spend the morning exploring monumental Lima. We start with a visit to Barranco, a seaside district dotted with lovely historic monuments and antique mansions. Drive by swanky Miraflores, Lima’s most vibrant district. Then on to downtown Lima but not before passing by Colon Avenue, a once elegant avenue lined with trees, flower beds, marble benches and flanked by impressive mansions built by foreign architects. Then stroll by Lima’s stately Plaza Major and visit the treasure-filled 16th century home of Sr. Aliaga, a home that has remained in the same family since the 16th century! We then cross the Rimac River to visit he former playground of the 18th century Viceroy Amat. His love affair for his concubine sparked an architectural frenzy that included the creation of various shaded Alamedas and even the construction of the Acho Bull Ring, the oldest in the Americas. We end our visit with a guided visit of the beautifully restored convent of Los Descalzos. The convent, containing over 300 paintings pertaining to the various schools of religious art, is a treasure trove of antiquities. Then off we go to our “welcome lunch” at Huaca Pucllana Restaurant located adjacent to the 2,300 year old pyramid of the same name. This evening, enjoy a Nawpaq Expeditions special: a welcome cocktail at my mother´s house. After breakfast, get set for a three-and-a-half hour scenic bus ride to Paracas, the gateway to Ballestas Islands. On our way, we will drive by irrigated valley sustaining a booming export-economy and attracting countless migrants in search of employment. Their makeshift homes can be seen everywhere. After a hearty sea-food lunch in Pisco, we will take a short drive to Paracas to start our breath-taking tour of the wind-swept peninsula that forms part of the National Reserve. The arid peninsula, punctuated with rolling sand dunes of different hues and dramatic cliffs that plunge onto the ocean, is notorious for the lack of life; not even a solitary cactus can be seen. But the barren landscape did not stop the ancient Paracas people to take advantage of the desert; they built sophisticated underground tombs for their hundreds of mummies that now form part of the permanent collection of the Museum of Anthropology and Archaeology in Lima. We will then return to our charming bayside hotel to enjoy a beautiful sunset. This morning, we will navigate to the Ballestas Islands to enjoy a visual spectacle of avian life. You will be stunned by the thousands, yes thousands, of (mostly) resident shore birds flying in and out of the various nooks and crannies that dot the volcanic islands. Among them are the elusive humboldt penguins; the stunning Inka terns; the neo- tropical cormorants and the guanay, the most common bird in the islands. Indeed, so numerous are these birds that they have been known to turn light into darkness by concealing the sun-whenever they would take off to feed in the nutrient--rich, cool waters of the Humboldt Current. These birds depend on huge quantities of fish and they, in turn, depend of smaller fish and krill that “ride” the current’s cold upwelling. After our tour, we will go back to our charming hotel, have some lunch (on your own) and then we will drive back to Lima arriving there early evening. Take an early morning flight to Iquitos, the gateway to the Lower Amazon River. Then transfer to our boat and navigate up-stream to the Muyuna Lodge facing the river and surrounded by immense track of rainforest teeming with wildlife. The area, known for its meandering ox-bow lakes and small inland rivulets, contain a high concentration of fish attracting countless birds; monkeys; sloths and other wildlife that mimic a “fluvial zoo” After lunch, we will take a hike to explore the understory of the rainforest to get a better understanding of the exuberant flora and its wide variety of usage. In the evening, enjoy a different perspective of the Amazon by taking a nocturnal boat ride along the river to spot caimans, cousin to the better known crocodile, and to hear a symphony “composed and conducted” by the thousands of insects, frogs and other creatures that lurk in the vast rainforest. Today immerse yourself in the exuberant sights and sounds of the rainforest. We begin by navigating the Yanayacu River towards Sapote ox-bow lake that is ringed by hundreds of trees offering a golden opportunity to see riverine avian life at its best. Enjoy photographing birds like toucans, parrots, cormorants, terns, different types of macaws and even eagles - with their roving eyes suited to swoop down and catch his/her pray. We may also see sloths perched in their customary habitat (tree branches) and yes monkeys, like the petit and cute capuchin and spider monkeys and, if we are lucky, we may even see the indistinguishable red howler monkey whose cry can be heard for miles. In the evening, stroll by the understory in search of frogs, insects and other critters! This morning we will navigate the Corriente and the Purura ox-box lake to try our luck with fishing toothy piranhas! We will also get an opportunity to navigate a tranquil area of the river to see the giant Victoria Regalia, the world’s largest water lily and then on to the Amazon to see the fresh -water grey and pink dolphins and, if you want, swim with them! These dolphins, along with the Amazonian sting- rays, are relics of the past when the ancestral Amazon River flowed westward and this part of the Amazon consisted of a large inland sea. The honeymoon ended when, some twenty million years ago, the Andes began to rise trapping these salt- water creatures. 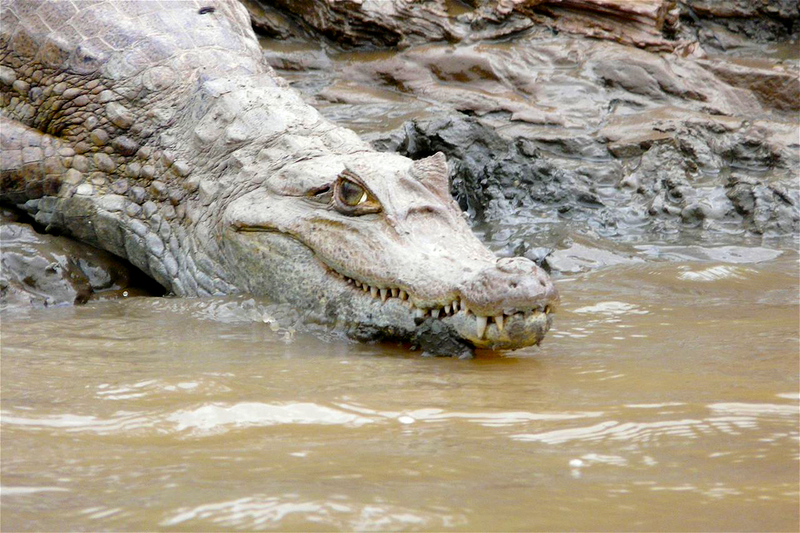 And nature being nature, these creatures faced a “choice:” either adapt (to fresh water) or perish! By now, we are ready to go back to our lodge, have lunch, and then navigate back to Iquitos arriving there late afternoon. Upon arrival, we will check in to our charming Casa Morey boutique hotel, a 19th architectural gem that belonged to the Morey family whose wealth stemmed from owning vast rubber plantations worked by Amazonian natives often at appalling conditions during the gilded era of the Rubber Boom days which ended abruptly in 1912. The hotel has the added advantage of being only a stone throw away from the historic promenade facing the mighty Amazon River, the world’s largest river (6,885 kl. long). Depart from Iquitos to Cusco (via Lima) in the morning. Upon arrival, we will hop on our bus and drive directly to Urubamba via the scenic and fertile Sacred Valley of the Inkas. The town, located some 2,000 feet lower than Cusco, will provide you with an opportunity to acclimatize to the altitude. On the way, enjoy perusing the spectacular Inka terraces that line the valley stopping at the colorful Pisaq market to enjoy the wide assortment of jewelry, textiles, sweaters and other goods available at the market. 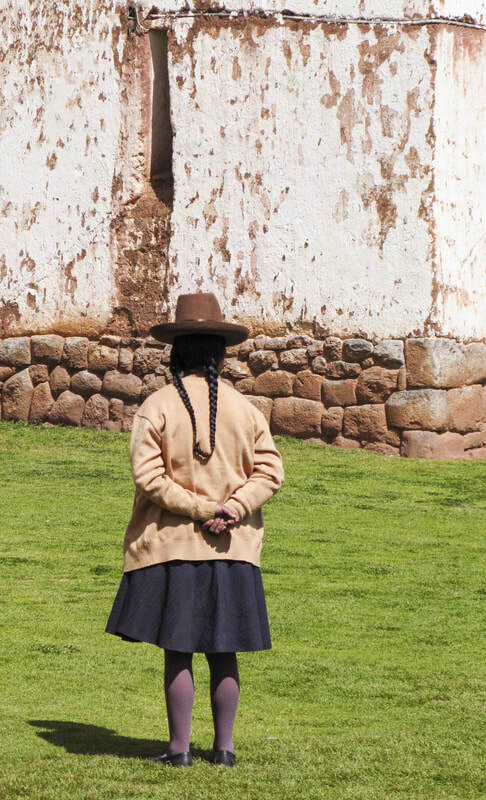 Enjoy a full-day tour of the Sacred Valley of the Inkas. Explore the residential quarter of the Inka nobility in Ollantaytampu. Tucked on the southern side of the Patacancha Valley, the town represents the finest example of Inka urban planning. 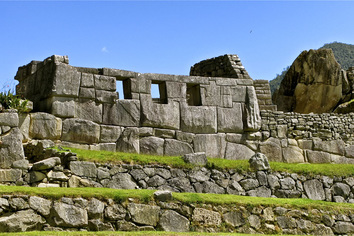 Inka engineers designed the spacious residential canchas (walled enclosures) to fit within the contour of a trapezoid, the hallmark of Inka architecture. Today these ancient walled enclosures have been subdivided and are now occupied by members of the peasantry! Then walked towards the ancient terraces and ascend to the religious quarters of Ollantaytampu visiting the unfinished mega-temple made of pink granite with its associated structures, water fountains and storage facilities. We will then ascend the Patacancha River to enjoy a Nawpaq Expeditions specialty meal: a “Pachamanca” or an earth-oven lunch consisting of a wide assortment of native vegetables, all of which are cooked inside a dug-out pit with hot stones. 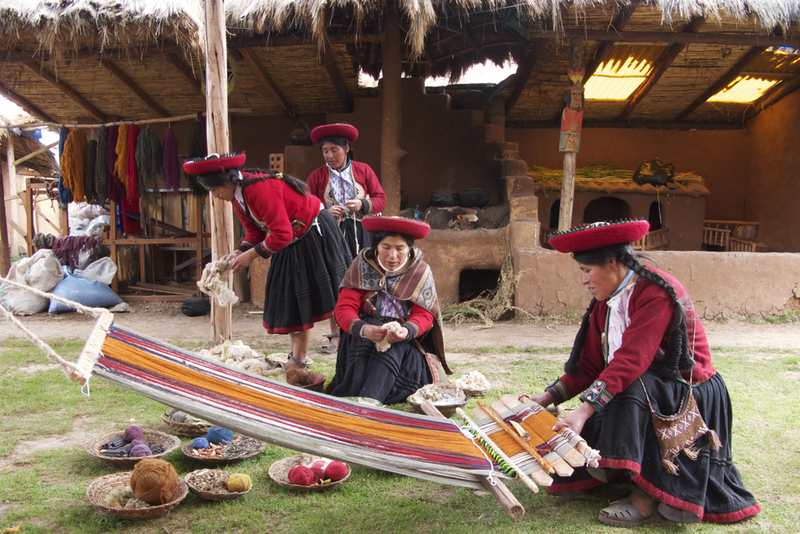 The nearby Wallok village, known for weaving radiant-red textiles, is one of many peasant communities that dot the Andean landscape. Get set to take the Vista Dome’s 09:15 hrs., train to the legendary site of Machu Picchu, a World Heritage site and one of the ancient wonders of the world. The one-and-one-half-hour train- ride cuts through several ravines and gorges before terminating at the edge of a cloud forest at Aguas Calientes. We will then take the shuttle bus up to the ruins and proceed for our all-inclusive lunch at the Sanctuary Hotel restaurant adjacent to the ruins. Unlike other tours, we will spend at least three hours exploring the site that include, among other areas, the elite quarter and the various temples, shrines, fountains and plazas. As you will see, the Inkas mastered the challenges of Machu Picchu’s uneven, rain-soaked and quake-prone terrain by terracing and leveling most of the site and by constructing a series of intricate moats, canals and ducts. These, and other engineering feats, made it possible for the Inka to build Machu Picchu in this lofty cloud forest and provide us with a deep sense of awe for Inka prowess and sophisticated urban planning. Enjoy a morning at leisure. You may choose to return to Machu Picchu and hike up Wayna Picchu to see its temples and steep terraces or, perhaps take a walk up to Inti Punku and re-enter Machu Picchu the way the Inka did. No matter what you do or where you are in greater Machu Picchu, the site offers commanding views of the surrounding cloud forest and, weather permitting, the various snow-covered peaks of the Vilcabamba Range. Or you may want to stay in town and stroll along the promenade facing the roaring Urubamba River. Just make sure to be back at the train station in time to take the 15:15 hrs., Expedition train to Cusco (via Ollantaytampu). On the way, we continue to experience the aura of the Andes by observing, from the comfort of our scenic train, the numerous snow-capped peaks and hanging glaciers that flank the Sacred Valleys of the Inkas. malquiz. From here we will drive to Sacsayhuaman, a large zig-zag-shaped temple-fortress built on top of the city and made of huge polygonal stones (some weighing over 100 tons!) and then on to mysterious Kenko. Enjoy a day at leisure and explore Cusco’s quaint narrow streets and historic districts on your own (all within walking distance from your hotel). For those who want to engage in a morning activity, you may want to visit the cathedral with its fine collection of historic paintings and/or join Manuel and visit the Museo Casa Concha housing the large collection of artifacts removed from the site by Hiram Bingham in 1912 and 1916 respectively and finally repatriated to Peru in 2013 (after a contentious legal battle that lasted a few years). The entire operation (wrapping, shipping and re-assembling them for exhibition) cost Yale University over a million U.S dollars! Get ready for a day-long drive culminating on the shores of Lake Titicaca, a lofty lake crowning the Altiplano, the “roof of the continent.” We begin by visiting Raqchi, a major Inka site known for its numerous Qollqas (storage facilities) and its imposing temple containing soaring columns, a rare feature in Inka architecture. After lunch, we continue our journey and drive through some spectacular landscape before reaching La Raya, the highest point of our tour (4,338 meters) and the source of the Urubamba River, a tributary of the mighty Amazon. Here you are likely see hundreds of alpacas (and vicunas as well) roaming the wind-swept landscape of the Altiplano. We then descend to Pucara and visit the archaeological remains of what was once the capital of a pre-Inka kingdom and where the lovely terra cotta bulls are made! 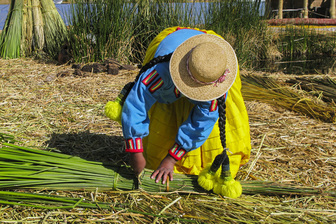 We terminate our drive in Puno, the folklore capital of Peru, located on the shores of Lake Titicaca. We will start our day with a short boat ride to the floating islands of the Urus, an enigmatic people who have retained their cultural independence since pre-Inka times. 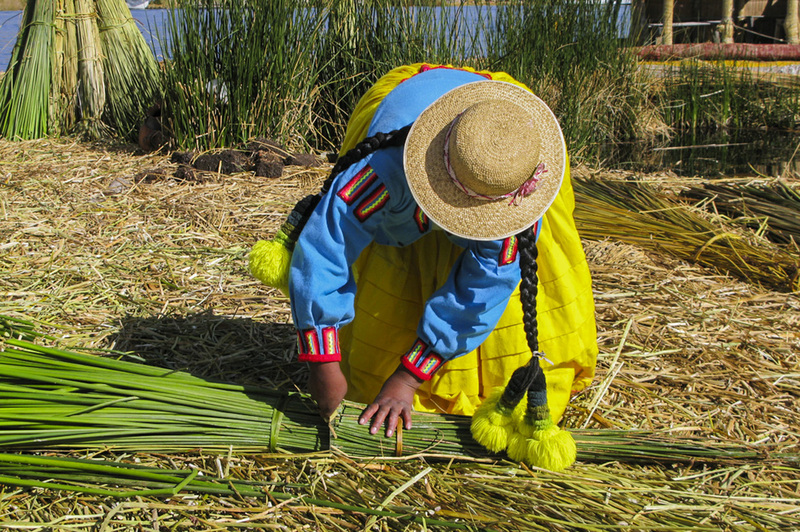 They will gladly demonstrate the multiple use of the totora reed, an edible grass used for making just about everything; from their floating islands, to their houses and even their boats! From here we will navigate to Taquile to explore the lofty island, enjoy its breathtaking view of the snow-capped Cordillera Real of the Andes, and enjoy a trucha (trout) lunch. Interestingly, the inhabitants of Taquile shun dogs; they are believed to bring bad omens. After lunch, we will return to Puno. Perhaps some of you may want to join Manuel and visit the restored 19th century steamer, the Yavari. Built in Britain and shipped to Arica (then part of Peru) in crates, the Yavari pieces were off-loaded and hauled up the Andes to the shores of Lake Titicaca on mule trains! The entire operation took six years! After breakfast, we set off to see the 12th century burial towers of Sillustani and Lake Umayo. Built mostly of volcanic stone, the towers seemed to reassure the deceased Inkas and their predecessors with a kind of spiritual connection emanating from the sublime beauty of the pristine lake. Today, the small table-top-shaped island that crowns the lake is now a reserve and off limits to everyone but the small and shy vicunas, the smallest of the Andean camels and the one that possesses the finest wool in the world (6-8 microns). We will enjoy a box lunch at the site and then off to the airport via bustling Juliaca. Its congested downtown area lacks descent infrastructure but it is brimming with people engaging in various type of commercial activity. We will then board our plane to Lima in order for you to connect to your international flight home (ideally, it should depart around 22:00 hrs.). Important: nearly all of the sites covered on this tour require moderate to strenuous walking. Scaling the often muddy trails of the Amazon Rainforest; climbing the numerous and uneven steps at Machu Picchu and Ollantaytampu; walking up the crooked ramps of lofty Taquile Island etc. have posed challenges to some participants. To remedy the situation, I have structured staging areas where the tour members can for the group. Likewise, in order for you to acclimate to the altitude easier, we begin our Andean portion of the tour in the town of Urubamba and not in Cusco. The town is some 2,000 feet lower than Cusco and it is located in the Sacred Valley of the Inkas. …all of the land services which begin in Lima and ends in Juliaca. It is also guaranteed providing a minimum of 11 persons sign - up. The tour includes all entrance fees; sightseeing services; transfers and rides in trains, buses and boats and, unlike other tour companies, we also includes portage service (tips) at hotels and airports. Likewise, our tour also includes a Nawpaq Expedition educational kit designed to enhance your cultural experiences as well as daily breakfasts; a welcome cocktail at my mother’s house; two specialty lunches and other meals as specified in the itinerary. …the round trip international airfare of approximately $700 USD (from Los Angeles) and the four-segment domestic air totaling around $475 USD. The tour price also excludes tips to local guides, drivers, assistants and such personal incidentals as room service, laundry, telephone calls, alcoholic and non-alcoholic drinks, pre-tour inoculations etc. With a few exceptions, Nawpaq Expeditions only uses “four star” properties chosen for their location, price and service. Please refer to each of the hotel’s web site for additional information. Photo contributions provided by: Raymond Roy, Terri McMillan, Joella Taylor, Russel Unger.